This painting is now available as signed open edition print. Print size is 12×16 on 13×19 watercolor paper. Printed with archival inks. Introductory price is $ 100 + tax for a limited time. Print can be ordered and picked up or will be shipped anywhere in US for additional $ 10. 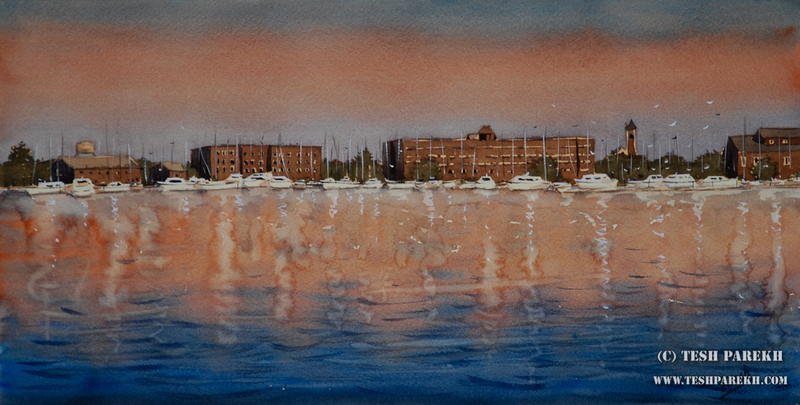 The original watercolor painting (21×29) is currently available. “Raleigh Autumn”. 12×16 signed print on 13×19 watercolor paper. This is late season portrait of the North Carolina winter. Ground covered with leaves and bare trees. I painted this at one my favorite spots at the Durant Nature Park. 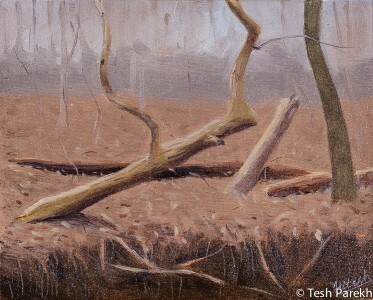 I will be doing more plein air painting in oils this year. My interest, as always, is in creating traditional art. I am not interested in broken color effects or masterful brushwork or brilliantly transparent passages. I do not use paint thinners, mediums or any other secret ingredients when I paint in oils. So, my goal is to cover the painting surface with paint layer without worrying about special effects. If the painting turns out to be good, it is simply by-product of focused observation followed by simple execution. I used Charvin paints for this painting. It is painted on Winsor & Newton canvas panel. I had applied oil painting ground on this panel few months ago. This year is going to be busy for plein air painting. So, I will be certainly exploring more painting surfaces. “On the Edge”. 8×10. 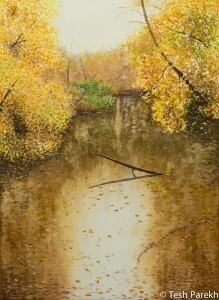 Plein Air Oil Painting on panel. 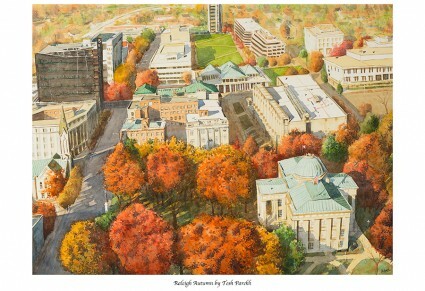 After doing many paintings of Raleigh, I am finally getting around to painting Chapel Hill! I have been exploring new paints, and papers. For the University UMC painting, I used new (to me) QoR paints. I need to paint more before I decide on using this range long term (I normally use Holbein and Winsor & Newton). (1) Plein Air: I normally paint on un-stretched watercolor paper en plein air. This works fine for smaller sizes. However, at sizes bigger than quarter sheet, the paper does cockle. Most of the times, this is not an issue. However, it does make painting difficult under humid conditions. This should not be a problem for Aquabord. (2) Framing: I frame all of my work. This does get expensive and time consuming. 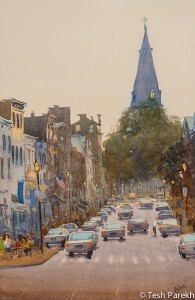 Framing becomes bigger challenge for plein air contests and wet-paint sales. Aquabord can be framed like Oil paintings- without the mat and glass. 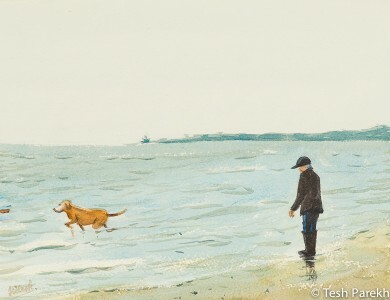 (3) Contests: traditional watercolor paintings, by nature, are subtle. This subtlety is lost many times on folks judging plein air and other art contests. I often see badly painted oil paintings being awarded top prizes- just for being painted with oils! Not enough attention is paid to framed (or un-frmaed) works on paper. I do not wish to change my painting style just for the sake of art contests! 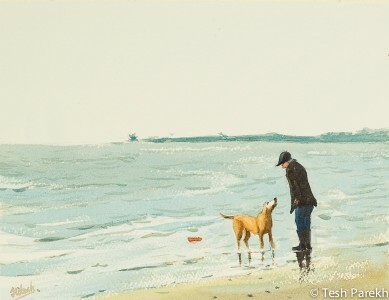 I work in traditional manner, and do want my paintings to have a fair chance in contests. So, I am open to try surface other than the paper. (1) Warping: the board did warp very slightly initially. Leaving it flat for couple of days seems to have fixed it. I guess I can also use 1.5″ or 2″ deep panels. Of douse, this also depends on how I want to frame my work. (2) Framing: The big one! I am following instructions on the Amersand website. I have applied Krylon UV Archival Satin varnish. I am yet to apply Golden Polymer UVLS Satin varnish. Not sure how this process will work for plein air contests and wet-paint sales. I may contact Ampersand to get their tips. (3) Storage: I store my watercolors flat (with or without mat). Paintings on Aqabord will require more storage space and better handling. (4) Paint handling: I like to draw (sometimes in detail) before I start painting. The drawing was not easy on this surface. I used softer lead (4B)- most of the drawing came off during initial wash. I did not fix the drawing since I was unsure about the paint handling after applying the spray. Paint handling was very different from my favorite papers. I was not sure what the washes were doing! I had to apply the washes very carefully as underlying layers seem to come off. Lifting the paint was easy, when I needed to. The board seemed to stay wetter longer. However, I like how the finished painting looks. Initial varnish seems to have saturated the colors even more. So, I will be certainly painting more on the Aquabord. I will be trying Gouache, and Drybrush techniques over next few days. And I also plan to use it en plein air. I am also exploring another Ampersand product- Claybord. I am working on my first Egg Tempera painting on Claybord. More on that later…. Chapel Hill University UMC. 9×12. Watercolor painting on paper. Painted with QoR paints. Carolina Inn Evening. 11×14. Watercolor painting on Aquabord. My paintings for the ArtSource Art exhibition benefiting the Second Chance Pet Adoptions. This triptych will be on display for sale, April 11th-13th at the ArtSource in Raleigh NC. 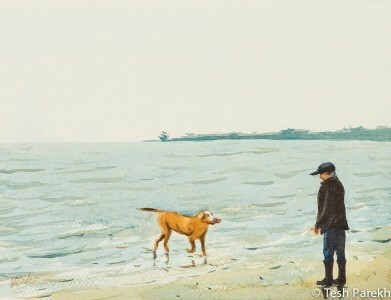 The UNCONDITIONAL art exhibit explores the unique bond between humans and pets. If you are a pet-lover or art-lover, you will enjoy this event. Fetch # 1. Watercolor painting on paper. 9×12. Fetch # 2. Watercolor painting on paper. 9×12. Fetch # 3. Watercolor painting on paper. 9×12. 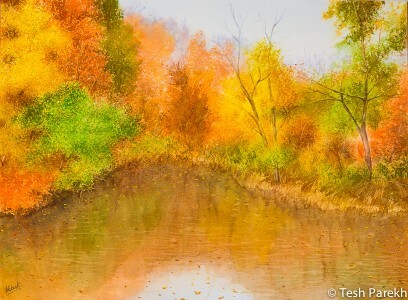 More paintings of beautiful North Carolina fall! I love the colors of North Carolina Fall. Last year, I did many plein air paintings during the fall. Plein air pieces are normally quarter to half sheet in size. 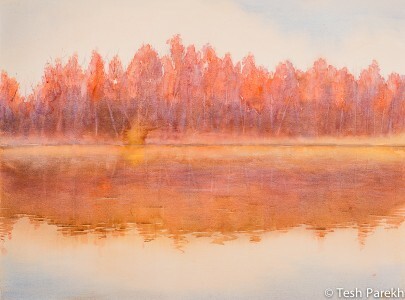 I wanted to capture autumn’s glory on larger scale. So I painted below pieces in my studio. All the paintings were painted on full sheet of Arches Cold Press 140 lb paper. Due to the scale of the paintings and the amount of water I used, I had to stretch the paper. I have tried different ways of stretching the paper. The only stretching technique that has worked for me is Nita Engle’s technique. Nita has shared this technique in her book. This technique keeps the paper flat during the painting process. Arches Cold Press paper, once stretched, is a joy to use. It takes the washes and lifting well. I have been trying new paints, and papers. And although I have achieved good results on variety of surfaces, I have liked Saunders and Arches papers the best. For drawings, I have recently started using Stonehenge paper and love it. One of the new surface I have tried this year is Ampersand Aquabord, This is certainly a unique surface which I will be writing about later. 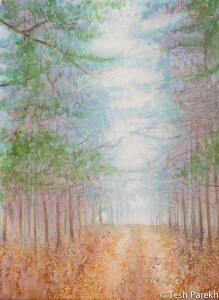 The paintings below are from the Durant Nature Park and other areas of Raleigh NC. Last year I had painted this en plein air. It was just fabulous! This is the studio version. My second painting for Visual Art Exchange’s annual Scope exhibition. Loved painting this in the studio as well. I look forward to Local Color Raleigh’s annual Paint Out this Saturday! I could not participate last couple of years. It is going to be busy day! After the paint out I have opening of my show at the Art of Style in Brier Creek. And then I head on to the All Saints Chapel to start a wedding painting, Because of the schedule of the Church and ceremony, I will finish the painting offsite. UNC Bell Tower. Plein air. Watercolor on paper. 14×21. On a recent trip to Chapel Hill, I saw this beautiful evening view of the UNC Bell Tower. I always carry my watercolors with me and really wanted to sit down to paint! However, finding parking was a challenge! And outdoor light does not last while you are driving around to find parking. I got my opportunity again few days later. I was at Top of The Hill Restaurant Bridal Show (actually it was a show for Grooms!) to promote my live wedding painting. I did a live event sketch while I was at this event (the event was organized by Joye Speight ot Virtue Events). And then headed out to paint the tower. It was a Sunday, but, parking was still hard to find! It is a busy area! Full of activities. I walked around to find this view. It was a beautiful evening. Little chilly. I finished most of the painting on location. It got dark, so, I headed home. I added details back in my studio. If you collect original watercolors, plein air work, Chapel Hill art or UNC art, this will be a great piece for your collection. The original painting is available, and I am also offering prints of different sizes. In fact, you can order prints of any of my paintings. Please contact me for details. 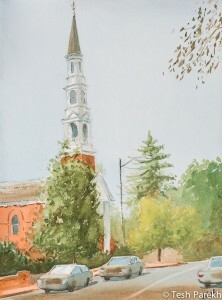 Last year, I had painted Jennifer & Ben’s wedding ceremony at University UMC on Franklin Street. 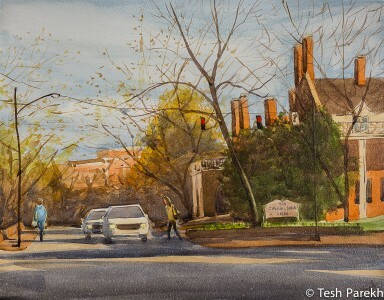 I also have a plein air painting of Franklin Street available. 2013 wedding season will start with a live painting in Asheville area. 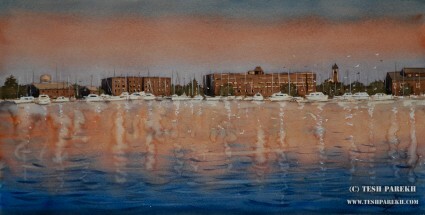 I love painting cityscapes! There is a certain challenge- you have to rearrange different elements to make a good picture while still keeping the character of the place. This is a studio painting. I saw this view of Raleigh Downtown recently in the evening. It was cloudy and windy. I could almost feel the snow! 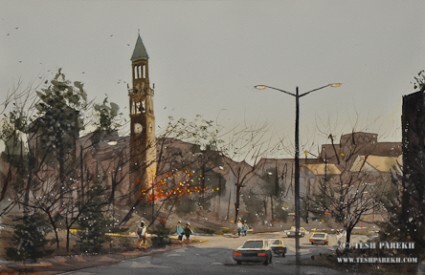 There is another painting I plan to do of the same evening: that will be a view of the State Capitol. I will be doing a painting for Downtown Raleigh Alliance next week on Feb 13, for their Annual Meeting and Awards. 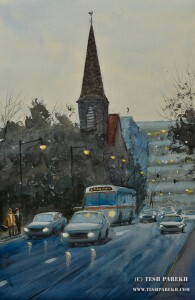 I get many inquiries for painting of Raleigh area: I sell both originals and prints. I also accept commissions. I live close to Wake Forest where I have had couple of art shows. The Cotton Company will be hosting another one in January, 2013. 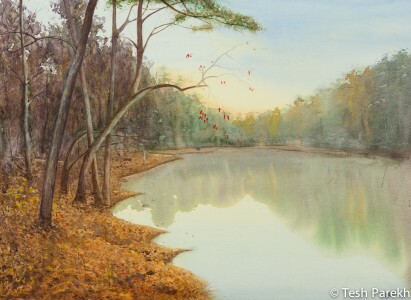 Earlier, I had posted recent paintings of Joyner Park in Wake Forest. I also love Seminary. Here are two paintings from area around the Seminary. I have always wanted to paint old house by the railroad. I liked how it looked at dusk. Although it shares the same title, it was not inspired by Edward Hopper’s oil painting! 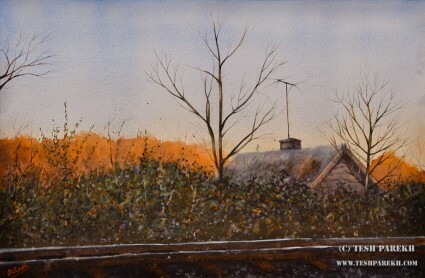 I was happy to have finished entire painting without masking the railroad tracks! Or using gouache. I often use gouache for accents, but, I can’t seem to accept the idea of using masking! I change things around as I paint. And using masking will not work with that. For me. 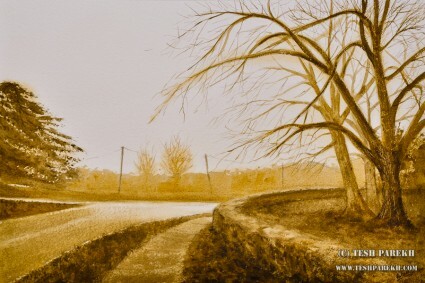 I used only three colors to paint “Bend in the road”. I wanted to keep focus on the road and trees on each side. As with every watercolor, I learned a thing or two from these paintings. I am amazed at this wonderful medium!